Back when plasma and LCD televisions first debuted, showrooms would often run a "virtual aquarium" on a bank of screens to highlight the lifelike picture quality. The breathtaking images would invariably evoke "ooohs" and "aaahhhs" from dazzled consumers who enjoyed soaking up the stunning clarity and color saturation, even if they weren't quite willing to shell out $20,000 for a set. Now that prices have dropped significantly and HDTV has become more mainstream, Columbia TriStar has decided to make aquatic window-dressing readily available, too. Naked Fish is the title of the studio's inaugural offering, and they've pulled out all the stops, lavishing Superbit technology and both Dolby Digital 5.1 and DTS audio tracks on the 65-minute DVD. Five virtual tanks are available for viewing�Classic, Predator, Shark, Living Reef, and Nautilus�accompanied by either "soothing" or "playful" sections from (what else?) Handel's Water Music. In addition, authentic aquarium sounds can also be piped into your speakers (if you can stand the grating gurgle), both full and widescreen presentations make the disc suitable for any TV, and a weblink provides access to free computer screensavers and desktop wallpaper. Kinda cool, huh? Well, before you get too excited, let me just say Naked Fish didn't knock my socks off like I anticipated and hoped. Maybe the prevalence of HDTV and crystal clear images on the current crop of flat-screen televisions has diminished the "wow factor" of virtual aquariums somewhat, but the disc never delivered the three-dimensional look I expected. The fish, though vibrant and colorful, never gave me the impression I could reach through the screen and pick one up, and the ever-changing camera angles made me constantly aware I was viewing a film rather than the natural ebb and flow of a real aquarium. Then again, I don't believe the disc was ever meant to be "watched." 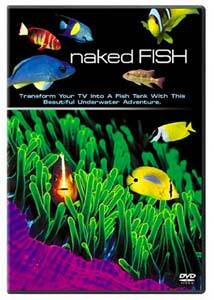 Designed more as a novelty to better integrate the TV into the fabric of a room or add ambience during social engagements, Naked Fish works much better when glanced at intermittently out of the corner of one's eye. And though the producers supply a generous array of tanks, it's a shame there's not an option for a continuous static view of the aquarium as a whole. I know it sounds boring, but in my view, the aquarium long shots are more realistic and visually pleasing than the close-ups of individual species. Is Naked Fish a critical piece of the home theater puzzle? Hardly. But if you think your TV dominates your living space and looks like a clunky chunk of chrome, a few naked fish will certainly warm up your surroundings and add a homey accent to your video system. Just don't expect it to be the hit of your next dinner party or the ultimate reference disc for HD. And for heaven's sake, don't assume Naked Fish will stop your kids from clamoring for a real aquarium. Take it from me�it won't. Image Transfer Review: A disc like this lives or dies by its image quality, and although vivid colors and nice contrast distinguish the video presentation, the Superbit technology lets us down just a bit. Sure, flashes of breathtaking clarity burst forth, but the transfer seems somewhat muted and soft when compared to others in the Superbit line. Yet the further away you view Naked Fish, the better it looks; the tanks seem clearer and more realistic from across a large room rather than up close and personal. The image, however, remains utterly free of any grit or errant specks, making this underwater experience seamless and silky smooth. Audio Transfer Review: Actually, I prefer Naked Fish without any sound at all (after all, how many home aquariums possess their own musical soundtrack? ), but if you want a complete multimedia experience, the disc complies with top-notch audio. Both DD 5.1 and DTS versions of Handel's Water Music are included, and though the DTS track sounds just a smidgen brighter and crisper, the difference is negligible. The natural aquarium sounds are presented in Dolby stereo, and are so realistically rendered, you might think you left a faucet running somewhere in the house. Extras Review: As one might expect, the disc includes no extras, unless you count a web address for free screensavers and desktop wallpaper. Trailers for Finding Nemo and Shark Tale or maybe an episode of The Undersea World of Jacques Cousteau would have been a hoot, but no such luck. Naked Fish does grow on you over time, and it's a clever way to maximize the capabilities of your home video system (as well as raise electric bills and prematurely burn out TV tubes). It is nice to see some color and motion on that big, blank screen when you enter the room, but whether it's worth the $24.95 list price is up to you.